Farewell 2014 – Say Hello to 2015! Biz, my Quarter Horse gelding, had to have another tooth pulled this spring. Fortunately, he had no complications. 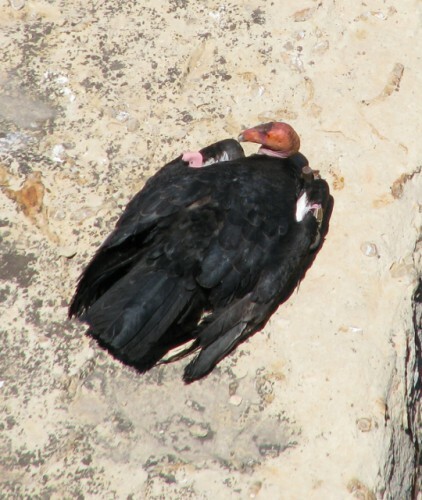 He also celebrated his 27th birthday! Jon and I took an amazing roadtrip to the Southwest. We visited six states, got to hike in some of the world’s most beautiful places, and learned about our country’s history. Plus, we drank some good beer, checked out the stars, and topped it off with a family wedding. I finished my sixth half marathon, with several of my close friends. It was a great weekend spent with good food, great wine, and fabulous company. I love my friends! It was my first half marathon with my husband too – I still consider it together even though he finished 90 minutes before I did. My uncle died in August, after a several year battle with colon cancer. I was fortunate to be able to visit him before he died. Jon and I took a trip to Michigan in October to visit my grandmother, aunts, uncles and cousins. We also got the chance to visit the northern part of mainland Michigan and sample some great beer and wine, and hike at Sleeping Bear Dunes National Lakeshore. Posts coming! Jon and I, with a lot of help from Jon’s dad, painted our huge deck. It was an incredible amount of work, and many gallons of paint! It also makes me wish that the previous owner had stained the deck originally, instead of painting it. I’m glad it is done (for now)! After driving by many times on our way to and from Portland, Oregon, Jon and I finally visited Mount St. Helens National Volcanic Monument. It was so cool! It was a quiet year on the kitty front – everybody is healthy and happy. Although Oliver is getting older, he is still well, Oscar continues to become more tame, and Coraline is a cheerful little pudge who loves tormenting her brothers. I have another new niece or nephew on the way! He or she – it is going to be a surprise – will be joining the family in February 2015! I took the plunge and accepted a new job. It is a promotion for me; I’ll be an HR Director! I said goodbye to my old job and will be starting the new one next week. I know I have said it before, but I do lead a blessed life. I am married to a wonderful man, have a successful career, and fill my off time with travel. I have family and friends who I love and treasure, and who love me in return. I hope all of you have had a good year too, filled with more joy than sadness. I can’t wait to see what 2015 brings! 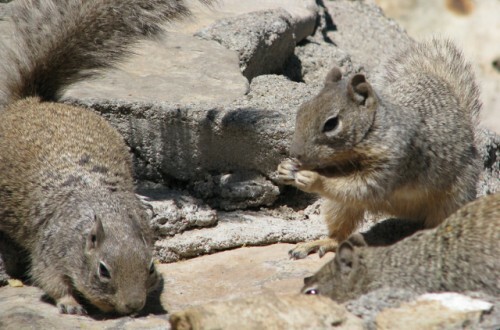 In my last post, I described our drive back to California from Williams, AZ. Once we arrived, the focus shifted from Jon and I being alone in the National Parks with seas of strangers, to being surrounded by loved ones. The masses were converging on the Marriott Marina del Rey to celebrate Jon’s cousin’s wedding. Other than the rehearsal dinner and the wedding, the last two days of our trip were unscheduled. We had some time to relax, and enjoy the company of family. And relax we did. Our hotel was located within walking distance (about a mile) from the famed Venice Beach, so we walked down to check it out. Over the two days we were there, we walked to the beach three times. The pier seemed bland, a hulking concrete structure that seemed to have no purpose. The beach was beautiful, with lovely sand and gently lapping waves. 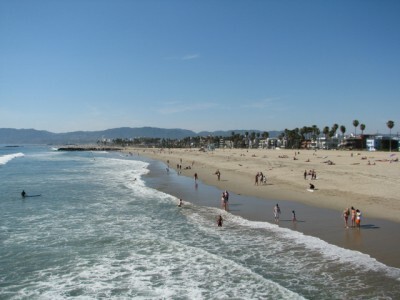 California really does have amazing beaches. I collected some tiny seashells, and we walked along talking and soaking up the sunshine. 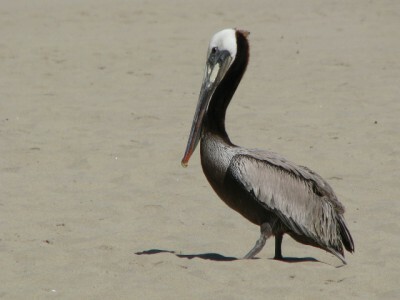 We also were treated to a Brown Pelican visiting. He was just hanging out on the beach, unfazed by the crowds. I was able to get some nice pictures of him, and when I zoomed in, I could get just him without all the people who were nearby. 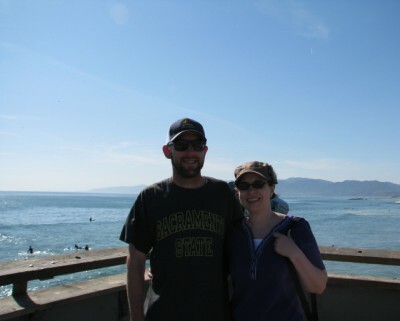 We also checked out the famed Venice Beach Boardwalk; I was completely and totally unimpressed. In fact, I was more than unimpressed – I was really put off by it. It was just shop after shop of souvenirs, and block after block of young men hawking black market CDs. Yuck! The wedding was great – the reception was a blast! It was fabulous to be a part of Jon’s cousin’s new start in life; his bride is wonderful. I’m sure they will have many happy years together. I got to do a little swing dancing to Brown Eyed Girl (one of my absolute favorite songs) with Jon’s uncle, who is a really good dancer. I just hope the video never makes it to YouTube! Because while he is a fabulous dancer, I’m sure my dancing is cause for much laughter among the audience! On Sunday afternoon, before heading to the airport, Jon and I made a visit to my uncle who lived in Los Angeles. He was battling colon cancer, and the diagnosis was terminal. It was a wonderful opportunity to spend a few quiet hours talking. We talked about travel, family, love and loss, and he told me stories about growing up with my grandparents, father, uncle and aunts. My uncle passed away in August, and although I did get to see him again only a few weeks before he left us, this visit is the one I treasure. After our visit, Jon drove us back to the Long Beach Airport, to drop off the car and take our flight home. We were more than relieved to hear the rental agent say “no damage” after the dirt road beating we had inflicted on that poor little car. And I wouldn’t be surprised to hear that they had to realign it after our trip. The flight home was uneventful, and a great end to a trip that made memories to last a lifetime. 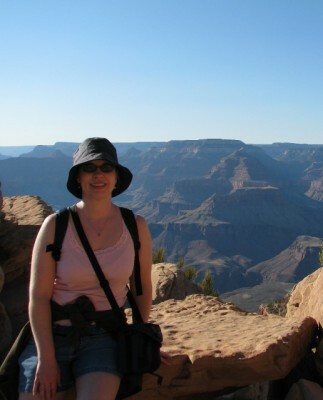 SW National Parks Trip: More Grand Canyon Village! 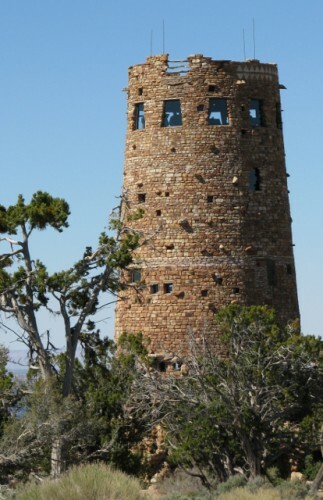 Lookout Studio – The Fred Harvey Company retained one of America’s first female architects, Mary Colter, to design a studio a short distance away from the Kolb Studio. 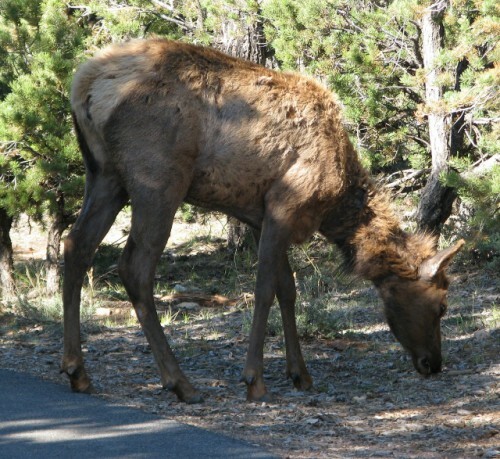 Colter subscribed to the ideas held by famous landscape architect Frederick Law Olmsted, which held that designs should blend in with their natural surroundings, and not detract from the stunning natural beauty that exists. Colter designed Lookout Studio using local wood and stone, and was very successful in creating a structure that is very unobstrusive. Lookout Studio from afar – it blends in well with its surroundings. Can you see it on the left, just below the horizon line? 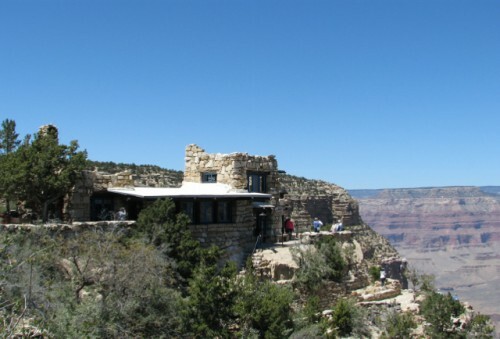 The studio was completed in 1914 and offered tourists a social space to enjoy a warm drink on a cold day, the opportunity to sit and converse or read a book, and the chance to view the canyon with telescopes and see what other tourists would experiencing with a mule ride into the canyon. The studio also contained a gift shop that sold postcards, paintings and other souvenirs; the fact that it competed with the Kolb Studio just down the path was a sore point with the Kolb brothers for years. Hopi House – Another of the Fred Harvey Company’s businesses, Hopi House housed and employed several Hopi artisans to make and sell Native American crafts to the tourists visiting the Grand Canyon. Mary Colter designed the building to blend with nature, and to also follow the style of the traditional Hopi dwellings. It was completed in 1905, right before El Tovar Hotel was finished. 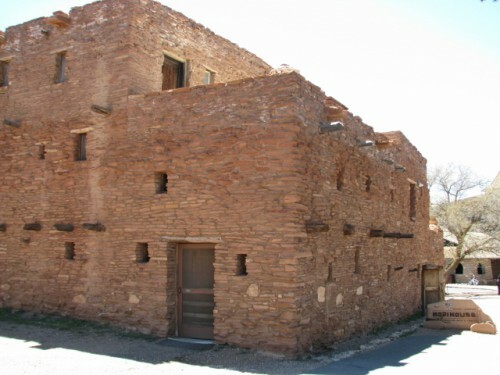 Hopi tribal workers built the building, which served both as a store and display area where tourists could watch craft items being made, but also as a residential structure, with several Hopi artisan families living in the upper floors of the building. 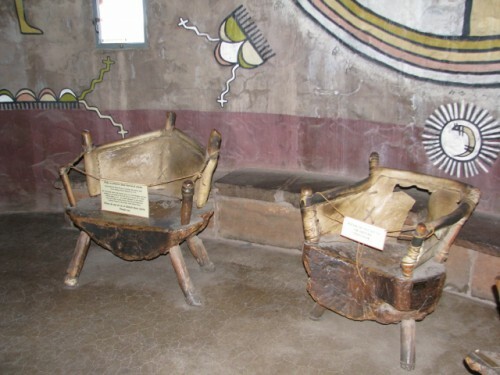 Hopi House was designated as a National Historic Landmark in 1987 and renovated in 1995, taking care to maintain the historic elements of the building. Buckey O’Neill Cabin – Buckey O’Neill was a young man who arrived out west from Missouri in 1879. He tried his hand at numerous enterprises, including running a newspaper, serving as a lawyer, district court recorder, tax assessor, probate judge and superintendent of schools. 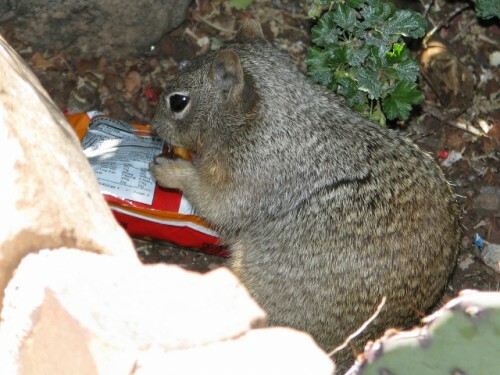 He also spent some time living at the Grand Canyon and prospecting for copper, but soon realized that the venture would not be lucrative. 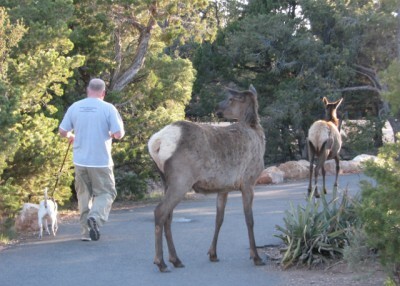 He did realize the potential of the canyon as a tourist draw, and worked tirelessly to improve access to the Canyon. He was an integral part of getting the railroad there in 1901. Sadly he didn’t live long enough to see the fruits of his labor – he died in 1898 while serving in the Spanish American War. The cabin that he built in the early 1890s is still standing – in the 1930s it was integrated into the Bright Angel Lodge complex of a lodge and cabins, designed by none other than – Mary Colter! 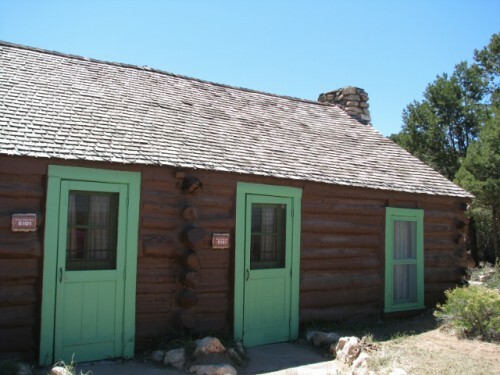 Tourists can still stay in the Buckey O’Neill Cabin, which is the oldest of the historic structures in the Grand Canyon Village. And as for Mary Colter? 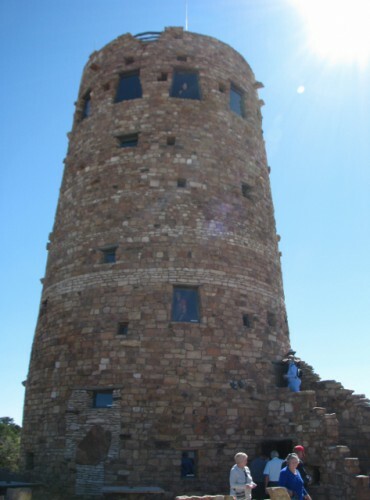 She enjoyed a long and successful career in design and architecture, working for several years for the Fred Harvey Company and designing many of the other buildings in the Grand Canyon. 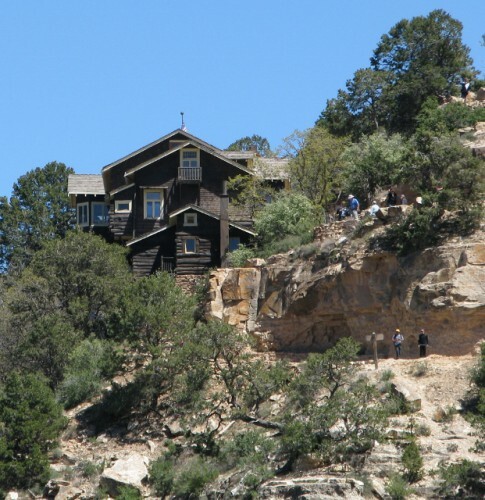 In addition to Lookout Studio, the Bright Angel Lodge and Hopi House, she also designed Phantom Ranch at the bottom of the Grand Canyon, Hermit’s Rest, and the Desert View Watchtower (I’ll be posting about this soon) and was responsible for decorating (but not designing) the El Tovar Hotel. 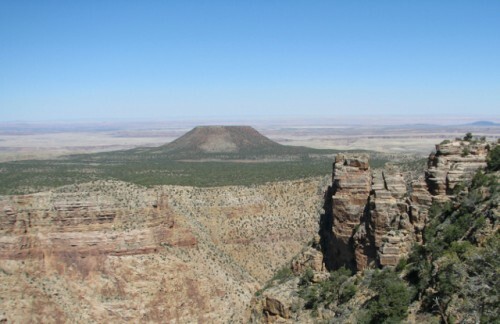 And her work isn’t only visible at the Grand Canyon; she has buildings throughout the southwest, including Winslow, Arizona, Gallup, New Mexico and Los Angeles, California. So what do you think? 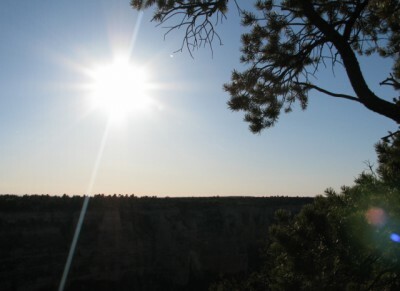 Which of the Grand Canyon Village’s historic structures is your favorite? 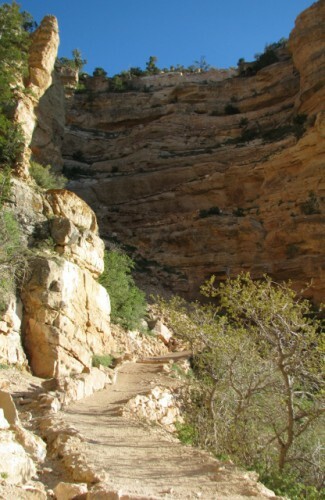 In my last post, I told you about our hike along the Grand Canyon’s Rim Trail, which ended up in the Grand Canyon Village. The Village is a village that sprung up at the northern terminus of the Grand Canyon Railroad, which goes from Williams, AZ, to the south rim. 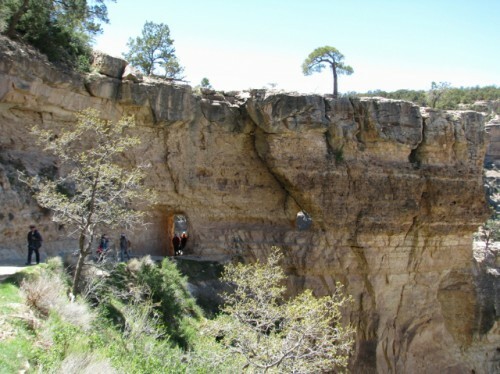 It was completed by the Santa Fe Railroad in 1901. Technically the village is a census-designated place (CDP) with a population of 2,004 people. A CDP is a community where people live that resembles a city or town, but lacks an incorporated government. El Tovar Hotel – The El Tovar Hotel was a Harvey House hotel (remember a few posts back when I told you about Harvey girls at the Painted Desert?) Yep, the Fred Harvey Company owned this place too; it opened in January 1905. 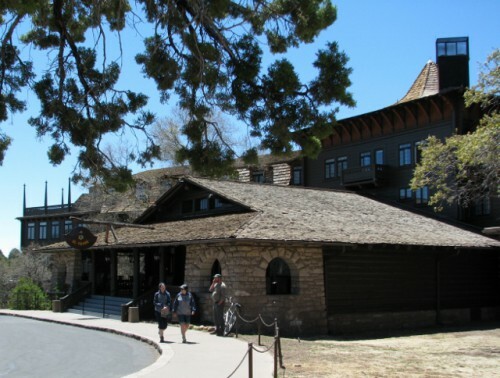 It was built in an architectural style that became known as National Park Service Rustic, similar to the Swiss Chalet style – it was made from local limestone and Oregon pine trees. The hotel originally had 103 rooms and 21 bathrooms, which have now been remodeled into 78 guestrooms, all with a private bath. The hotel also has a dining room that serves lunch and dinner, and a breakfast room. 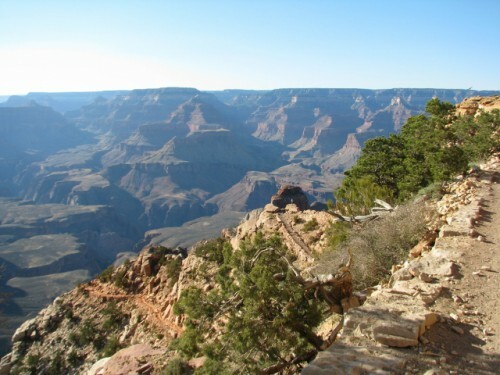 The views from the rooms must be stunning, as it sits only 20 feet from the rim. El Tovar Hotel – Built 1903-1903 – National Park Service Rustic style. You can stay there, but you have to book well in advance. And it isn’t cheap, with a standard queen room setting you back $228. But you just might rub elbows with the rich and famous – Theodore Roosevelt, Albert Einstein, Zane Grey, Bill Clinton and Sir Paul McCartney have all stayed there. 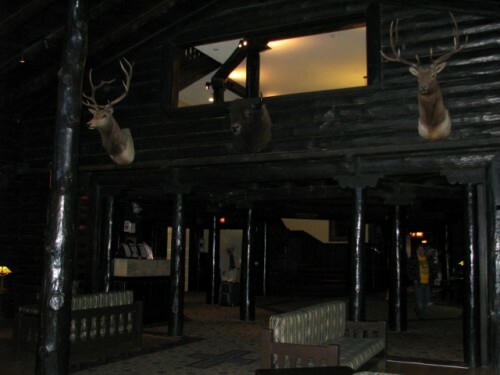 I was a bit put off by the decor though, the log walls are stained a very dark brown, black really, and adorned with all variety of animal heads. YUCK. 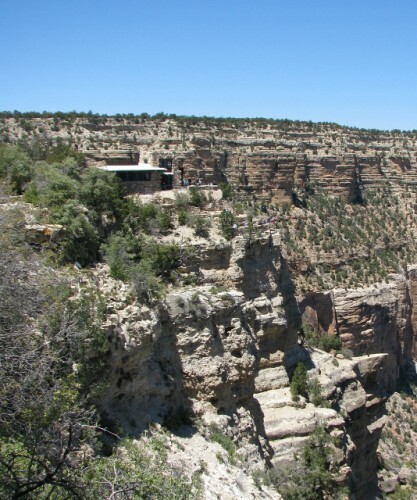 Kolb Studio – If 20 feet from the edge of the canyon isn’t close enough for you, you can visit the Kolb Studio, which is built hanging over the edge at the head of the Bright Angel Trail. The Kolb Brothers, Emery and Ellsworth, built a modest cabin to serve as a home and photographic studio. 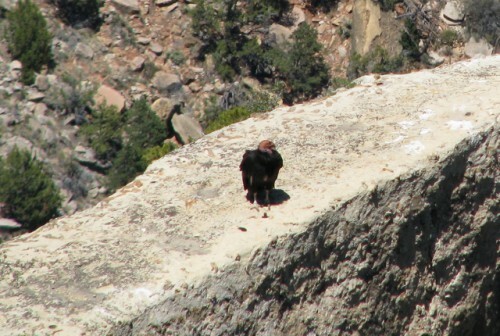 In an agreement with the owner of a mining claim who owned the property, they set up a tollbooth and charged $1 per head for livestock traveling down into the canyon. And they made a living photographing the tourists who were riding those mules. Over the years they grew the business, pioneered new photography techniques and became known for their stunning landscapes of the canyon. They even made a movie of their trip down the Colorado River in the winter of 1911-1912. This movie holds the record for the longest continually running movie in history, because after its tour around the United States, Emery Kolb showed the movie at the studio every day from 1915 to 1972. The National Park Service acquired Kolb Studio after Emery’s death in 1976; it now operates the five story, 23 room studio as a bookstore and gallery. 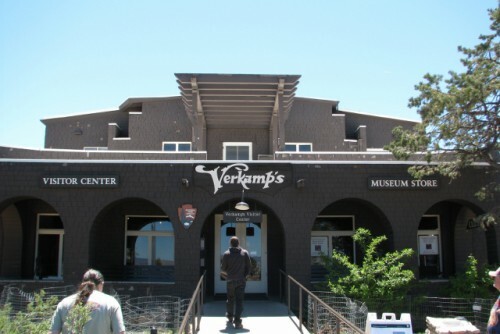 Verkamp’s Curios – John George Verkamp came out from Ohio in 1898, and went to work for the Babbitt brothers, owners of a cattle ranch and mercantile store, selling curios and Native America crafts to tourists visiting the canyon. However, he found that at the time, there weren’t enough tourists to make a living, so he closed up his tent within a couple of weeks. 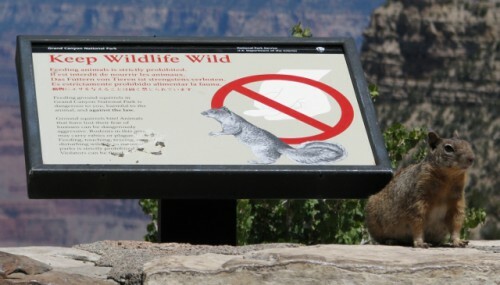 He realized however, that after the railroad to the south rim and the hotel were built, there would be plenty of tourists itching to part with some cash. And he was right. The building that exists today was built in 1906, and Verkamp sold not only high priced Native American crafts, but also postcards and trinkets for the common man. The building is a modified Mission architectural style. John Verkamp died in 1944, and the concession contract was almost not renewed; the Fred Harvey Company was eying the plot of land for a hotel and casino. John’s wife and children did manage to get a renewal of the contract, although sadly, talk of demolishing the structure continued into the 1970s. In 2006, the curio shop celebrated its 100th anniversary. Although the family had hired managers to run the business, they still oversaw it through a Board, making it the oldest family owned concessionaire in the park. In 2008, they finally decided to close the business, and the Park Service, thankfully no longer wanting to demolish the building, turned it into a museum and gift shop. I’ll tell you about a few more historic structures in the Grand Canyon Village in my next post – I enjoyed seeing them and imagining what it would have been like to be a tourist there 100 years ago!